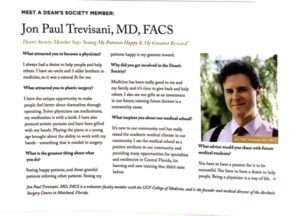 Our plastic surgeon, Jon Paul Trevisani, MD, was recently interviewed in the Spring 2018 newsletter for the University of Central Florida’s Dean Society, an elite cohort of physicians and community leaders who demonstrate a strong commitment to the education, research, and advancement of the medical community. In the publication, Dr. Jon Paul Trevisani speaks of the fulfillment he receives when given the opportunity to make a positive change in his patients’ lives, stating that, “Seeing my patients happy is my greatest reward.” Delving into the various aspects that inspired Dr. Jon Paul Trevisani’s endeavor into plastic surgery as a career, the article goes on to recognize his contributions to the Dean’s Society, as well as the university’s medical community at large. If you would like to learn more about Dr. Jon Paul Trevisani, or the range of treatments we offer at our Orlando practice, please contact the Aesthetic Surgery Centre today.